It has been a little while since I've posted. Last week was a little crazy and hectic, and though I did make a card, I did not have time to take any photos prior to giving it away. 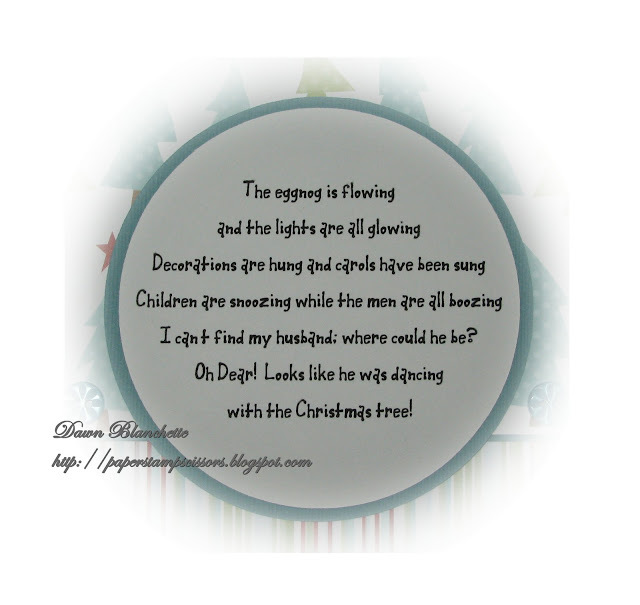 This week is back on track and I have another Christmas card to share. There are some challenges this week for cards with humour so I could not resist making a Christmas card for my husband. For this card I have used 'Lightening ﻿Edwin,' but I call him 'Too Much Eggnog Edwin.' This handsome fellow reminds me a little of my husband - one part cute and one part klutz. In all fairness, I should clarify that, to my knowledge, my husband has never tangled himself up in a string of lights. But I wonder if there is a 'Falling Out of a Tree Edwin' or a 'Dropping the Computer on my Foot Edwin' or a 'Chipped my Tooth on a Bottle Edwin.' I'm hoping that if my husband reads this, he gets caught up on the handsome fellow part and just skims over the rest :o). Back to the card, Edwin was stamped with black Stazon on watercolor paper and colored with Distress inks (shirt - forest moss; pants - weathered wood and tumbled glass; shoes - pumice stone and walnut stain; cheeks - tattered rose; hair - antique linen and walnut stain; lights - fired brick, tumbled glass, forest moss and spiced marmalade; electrical cord - pine needles and black soot; skin - watercolor pencil). The image and mat were cut using an emblem from the Forever Young cricut cartridge and attached with dimensional foamies. 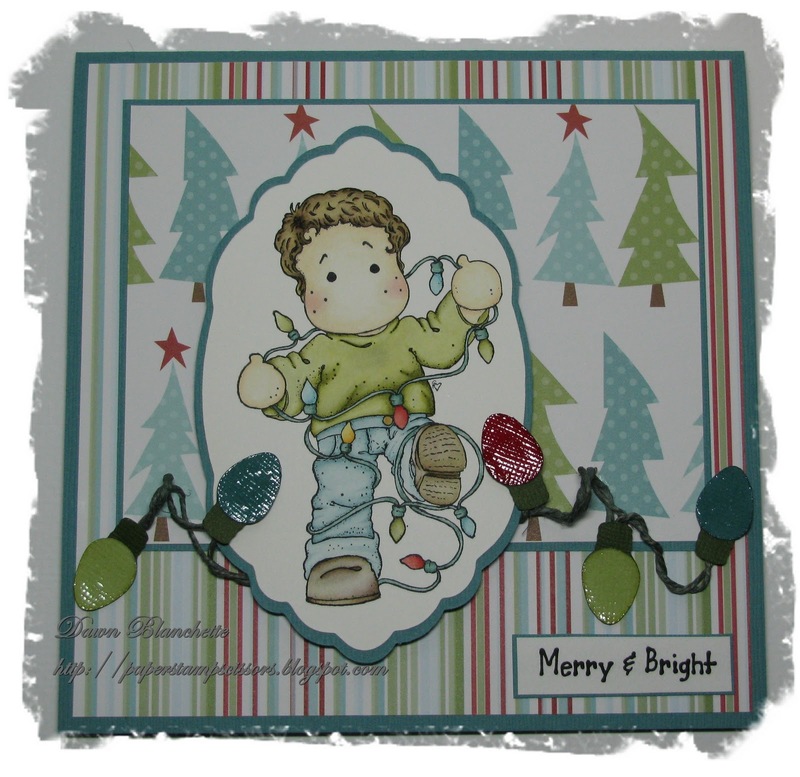 The designer papers are from the Snow Much Fun line by Three Bugs in a Rug and the cardstock is Bazzill. The sentiment was computer generated - I thought it went perfectly with the image. The Christmas bulbs are a paper piecing pattern from My Scrap Chick and they are attached with hemp twine that I dyed green. I applied Glossy Accents to the bulbs to give them a nice lustre. 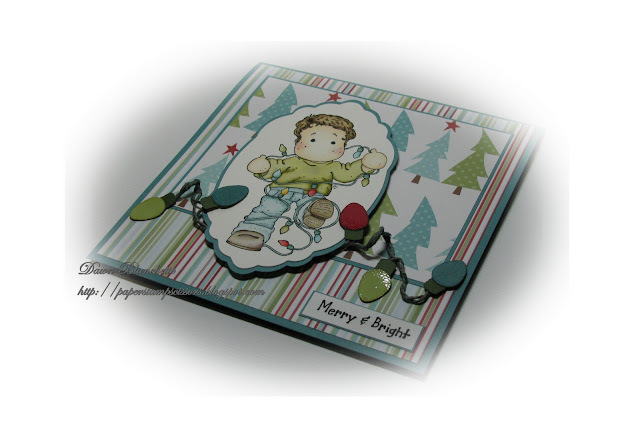 To keep the card masculine, I refrained from adding any other embellishments. I did, however, go the extra mile and decorate the inside of the card as well. 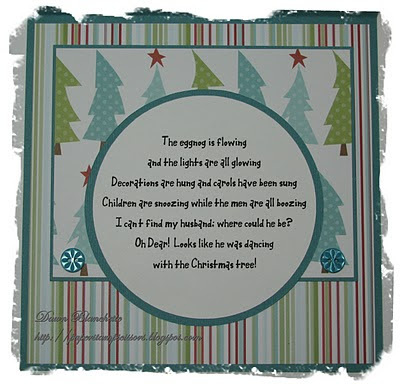 I followed the same layout as the front and composed a little poem for my hubby that is reminiscent of the holidays. In all fairness, I should again qualify that my husband has not, to my knowledge, ever danced with a Christmas tree. Hmmm, I wonder if there's an 'I caught my shirt on fire with the Christmas candle Edwin.' (Luckily he wasn't hurt). The buttons are from Stampin' Up. I hope you have enjoyed my card! Thank you for visiting and I hope you have time to leave a few words - I love reading them and like the chance to visit your blogs too! Thanks to my new followers - I am really happy to have you along and appreciate your support! WOW! I love it. Every little bit of it. 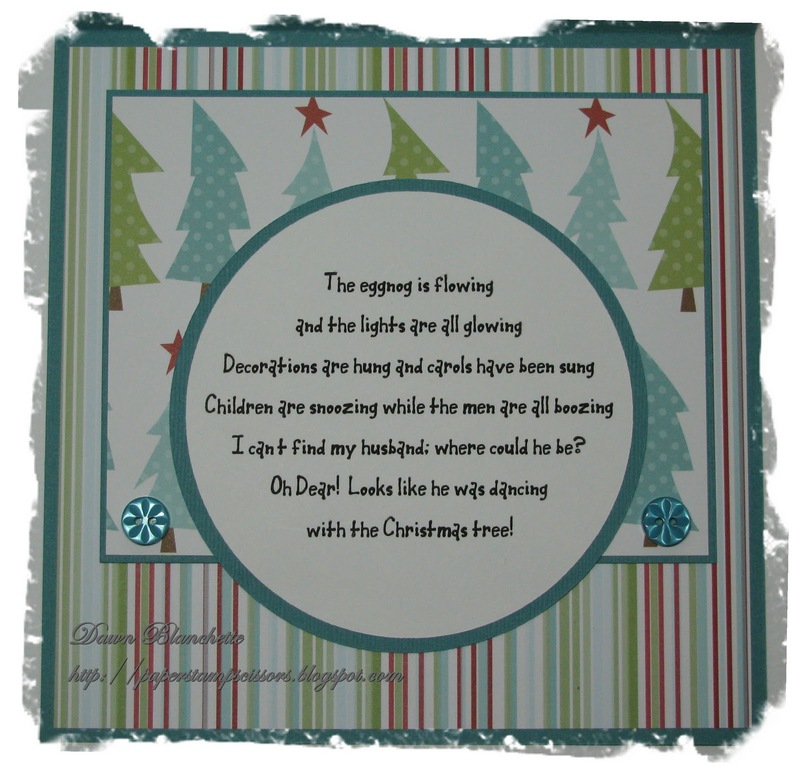 Awesome poem, coloring (especially using ALL distress inks! ), dying, stamping... is there anything I left out? It's just SUPERB (and cute, too!). I love this cute Christmas card! The verse on the inside is fabulous! Thanks for playing along with CSAYL this week!! Just fantastic - love the card - love the poem - it all really made me smile and as for the possibility of the other Edwins in a mess that so made me laugh too. Thanks for the ample qualifications dear, but in all fairness I probably have danced with a Christmas Tree at some point or another ;). Shall I assume I will be getting this card for Christmas? Terrific card! Love the image, the colors, the papers...everything! And I have to admit in my house I am the one that has gotten tangled in the lights,LOL. 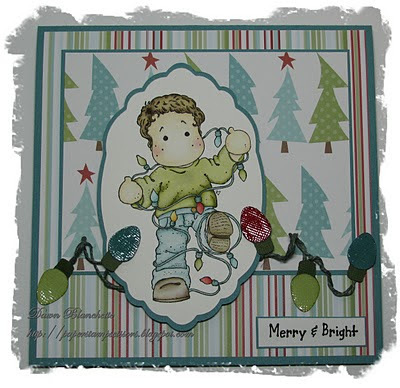 That inside sentiment is perfection ... and your coloring is wonderful too ... thanks for joining our jingle belles mayhem. Your card is absolutely beautiful...inside and out. I was searching for the humor, but then I read the inside :) Cute! haha...I love it...the interior is such a fun surprise! Oh my gosh girl, you're cracking me up! If you ever find a "caught the kitchen on fire with Jiffy Pop popcorn Edwin", please let me know! Your coloring is fantastic. Thanks so much for playing along with our Inside Outside challenge over at CSAYL! very fun and the matching inside is great!